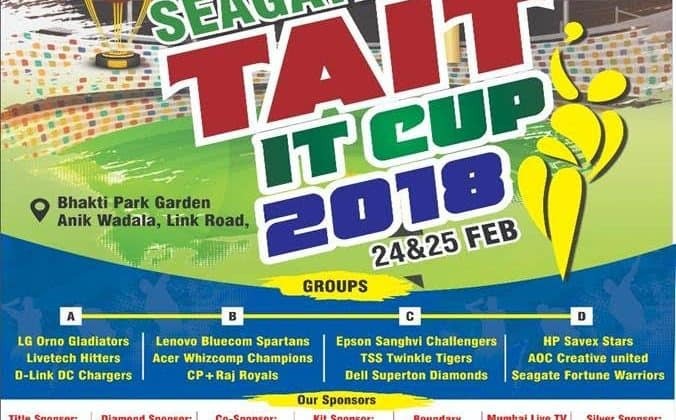 Trade Association of Information Technology (TAIT) is organizing Seagate TAIT IT Cup 2018. This year annually organized event is going to be held at Bhakti Park, Wadala, Mumbai on 24th and 25th February 2018. The tournament is sponsored by Seagate and supported with player’s kit by Acer. All teams are set to play and on 23rd February practice tournaments will take place. Tournament inauguration is on 24th February which will be followed by 1st round of Maha sangram & Friendly matches between TAIT Committee & Media/Sponsors. Semi Final and Final matches will be played on 25th February whereas closing ceremony will be at 6PM. Mumbai Partners all set for TAIT IT Cup 2018 4 out of 5 based on 1 ratings. 1 user reviews.